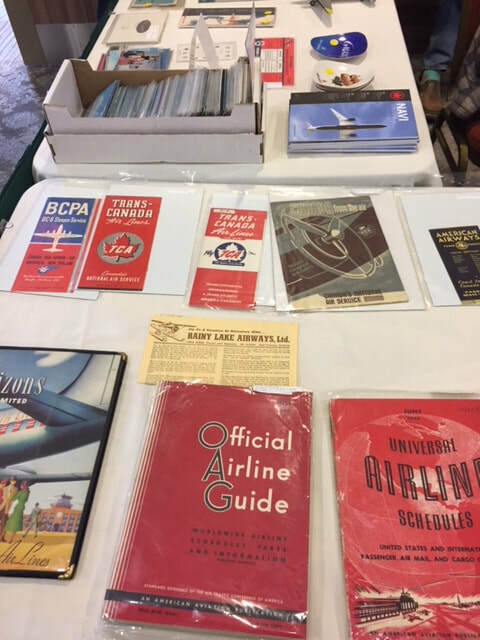 As conventions go, the Toronto airline memorabilia show is not exactly a massive draw, but for a couple of days in April, airplane geeks- and by this I mean mostly adult men over 50 who never grew out of airplane models- meet in a small convention room at the Hilton by Pearson airport to buy and sell their wares; for the serious collector, you can find obscure ticket jackets, airline timetables, plastic Chinese models of Canadian airliners, wooden Phillipino models of Canadian airliners and airline inflight socks from the 1970’s that I was afraid to ask who collected. 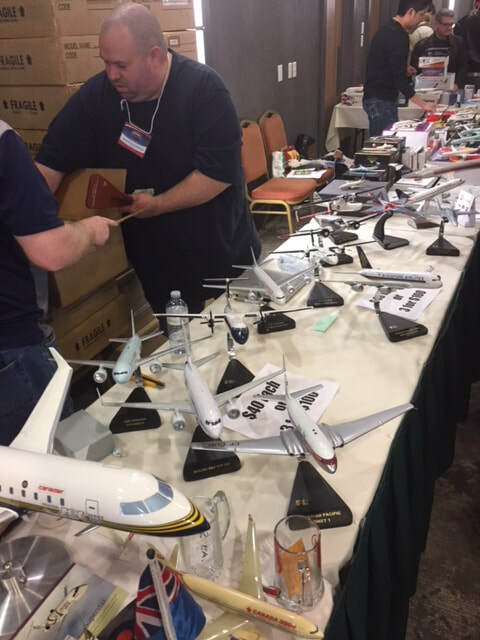 In fairness, I have to admit that I’m over 50, have over 60 airplane models, and an inexplicable need to collect aviation memorabilia- although so far I’ve been able to draw the line at inflight socks. The Toronto show takes all of about 10 minutes to plow through if you are not particularly interested in the nuances of whether Air Mozambique pilots wore cloth lapel wings or metal ones in 1981 (spoiler alert-they were cloth) but it is a fascinating event to attend if only to witness firsthand the passion of what I can only assume is a much larger subculture of serious aviation collectors than I previously thought- a lot of cash was passing hands for the joy of collecting airline memorabilia. 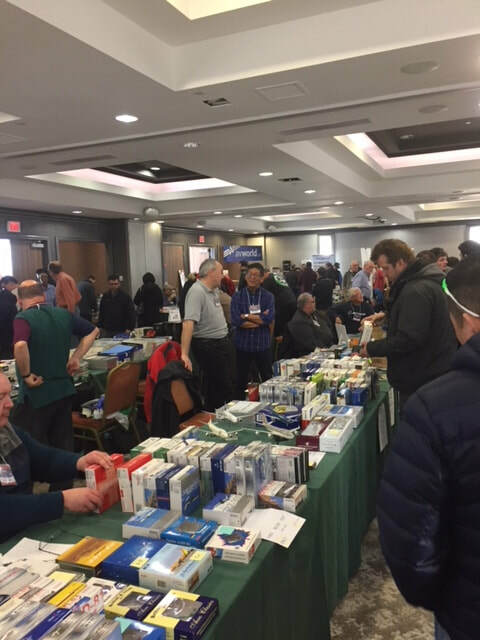 I think it must be an unspoken Canadian rule that if you are going to sell model aircraft at a Toronto Aviation Memorabilia show, you should really display at least one Avro Arrow item, and if you want to have any credibility at all, at least one of your close family members should have worked at the Avro plant in ’59. Even better if you have a story about a secreted-away component of said aircraft or other conspiracy theory about it’s demise/escape. 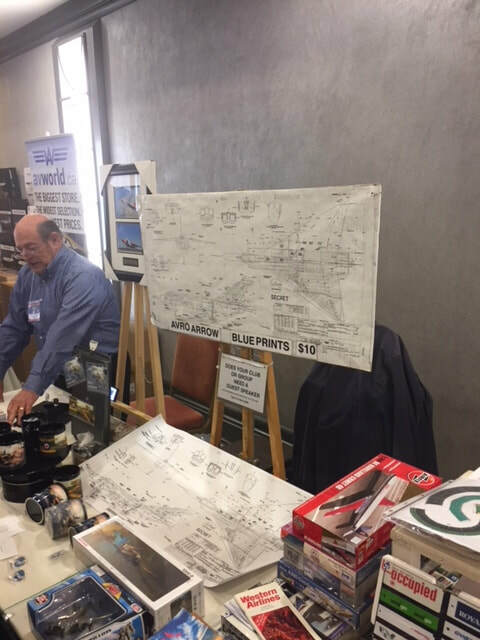 I stopped by one booth proudly displaying an original facsimile of the assembly drawing of the Avro and chatted briefly with the vendor, and local politician, Bob Cook who has written a couple of books on local Toronto history including the Avro plant. Bob recounted how his brother worked on the Avro’s Iroquois engine (oh snap, instant Aviation collector credibility)- so he just needs a secreted Avro Arrow part story, and he will rule the next show. Bob revealed that one of the Iroquois engines from the Arrow was returned to Hawker Siddeley in Britain where it subsequently became the prototype for the new engines being developed for the Concorde at the time-not sure if that qualifies as conspiracy or not…. 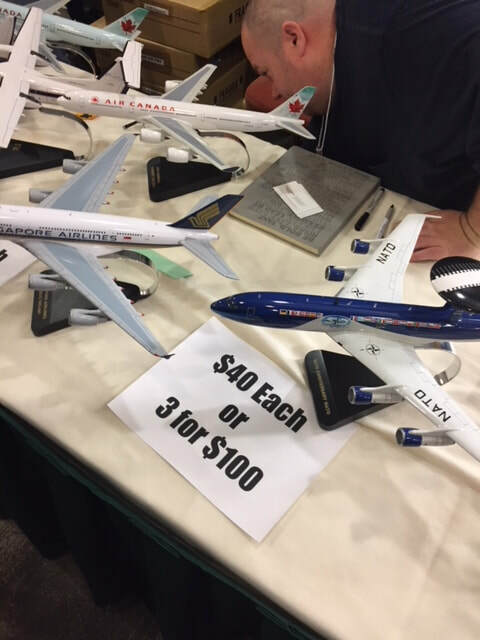 ​An interesting addition to the airline memorabilia show was that of a local artist, Jamie Restrepo who was selling prints of his original aviation artwork whose theme seemed to revolve around some kind of airplane-meets-humanoid and/or dragon theme. A typical work depicted a humanoid robot girl made of a B-29 Superfortress with wings for arms, the nose section for a head and and I presume ball turrets for breasts as evidenced by the gun barrels popping out- obviously Jamie owes a lot of his influence to the Transformers and Mike Myers movies. The person tending his booth revealed that people seem to either really like or really hate the artwork and my bet is the under 16 age group fall in the former. 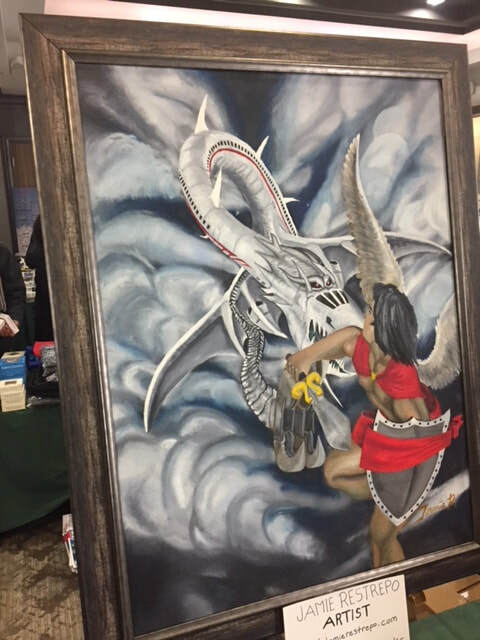 Nonetheless, Jamie was a very friendly artist who took pleasure in revealing some of the imagery he’d hidden in his artwork- one large painting depicted a Concorde whose front end had morphed into a dragon head to do battle with a Mexican (?) god, and I assume the Concorde dragon was destined to lose since Jamie pointed out that the call sign he’d attached to the Concorde’s fuselage paid homage to that of the doomed Concorde, flight 4590 which crashed on takeoff in France in 2000. ​Since my wife is getting close to her limit on the number of airplane models she’s willing to tolerate without them escaping into prominent display locations throughout our house (currently they reside in a guest room in the basement and a secondary bathroom), I thought a new venue for collecting might be found in aviation literature, but my plan was quickly squashed upon perusing the aviation publications table where I found that even obscure magazines like the Official Airline Guide from 1950 commands a $300 price tag (originally $9 for a years subscription). I settled for a nice collage of baggage claim tickets arranged in a simple frame for $6.50. I thought the tickets were real initially but was disappointed to find they were photocopies of originals that the vendor had collected over the years and was unwilling to part with- he mentioned that he reprints the collages from the originals for the shows and uses the money to fund his aviation travel bug, which I suspect likely only make it as far as the nearest airport Hilton- he was a very friendly gentleman and I was happy to sponsor his trip.